The 2015 Chevrolet Trax is the perfect marriage between the room and feel of an SUV, and the fuel economy and comfort of a full-size sedan. A subcompact crossover SUV that Chevrolet has been manufacturing in other countries since 2013, it wasn’t until this year that the brand new Chevy Trax made its way to showrooms in the United States, as 2015 model. This compact SUV is smaller than the midsize Chevrolet Equinox, but larger than a compact hatchback or sedan, offering more flexibility. Drivers of the 2015 Chevy Trax report a smooth drive that has the feel of a full-size SUV, without the gas-guzzling tendency of the larger vehicles. The Chevy Trax starts around $20,000, with great options like AWD. It comes standard with a turbocharged engine, and is the perfect choice for city dwellers that need a roomier vehicle. Offering great standard safety features, with even more impressive options available, it is an all-around great car for anyone who is looking for a great quality ride that Chevy drivers have come to expect. 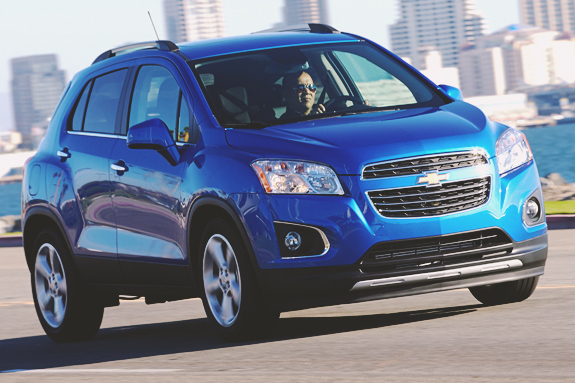 The 2015 Chevy Trax was designed to perform in the city. Whether living in an actual urban metropolis, or commuting to one each day, the Chevy Trax is an obvious choice. General Motors and Chevrolet designed the Trax to meet the unique needs of city dwellers, and packed the small SUV with features to maximize life in the big city. Whether driving alone or utilizing seating for up to four passengers, the owner of the Trax has more room and more options than ever before. With the standard turbocharged 1.4L ECOTEC engine, drivers will get an EPA-estimated 34 MPG highway, and 26 MPG in the city. Whether you are zooming around the city, or commuting in on the highway, saving gas is the Trax’s second nature. Connect up to 7 wireless devices on the built-in OnStar 4G LTE Wi-Fi. No matter where you are, or how fast you are going, the 2015 Trax will keep you connected. Chevy MyLink infotainment system, a seven-inch color touch-screen display, and Siri Eyes Free are just a few of the standard technologies that come standard on the 2015 Trax. Drivers can enjoy the elevated feeling and visibility of a full-size SUV, with the parking convenience of a compact car. The athletic exterior design help the 2015 Trax fit into the urban surrounding. No other vehicle in its class can offer as much cargo capacity as the Trax, which can pack in 48.4 cubic feet of storage. The eight different seating configurations will help you pack whatever you need, including objects up to eight feet long. With fifteen storage areas throughout the cabin, no other subcompact SUV can pack as much as the Chevy Trax. The 2015 Chevy Trax packs more standard safety features than any comparable vehicles in its segment, including a rear-vision backup camera and 10 standard airbags. The safety features make it a clear choice among those looking to purchase in the subcompact SUV market. The impressive turbocharged engine under the hood of the 2015 Chevy Trax helps drivers achieve 34 MPG on the highway, all while packing in 148 lb-ft of torque, and a whopping 138 horsepower. This standard 1.4L ECOTEC engine packs enough of a punch to have you zooming around the city as efficiently as ever, all while getting maximum fuel economy at the same time. The engine uses Variable Valve Timing to further aide in the high fuel economy rating, making it one of the most efficient gas-powered compact SUVs available on the road today. Drivers who are looking for even more flexibility on the road, the 2015 Chevy Trax comes with an available AWD engine, and starts at just $23,000. That means that drivers can get the convenience and efficiency of an AWD engine for just an additional $1,500 - less than any of the Trax competition. The AWD 2015 Trax has a starting MSRP of $430 less than the AWD version of the Nissan Juke, which shares its segment. The AWD option is perfect for those who are looking for increased maneuverability and traction in difficult terrain, or hazardous road conditions. 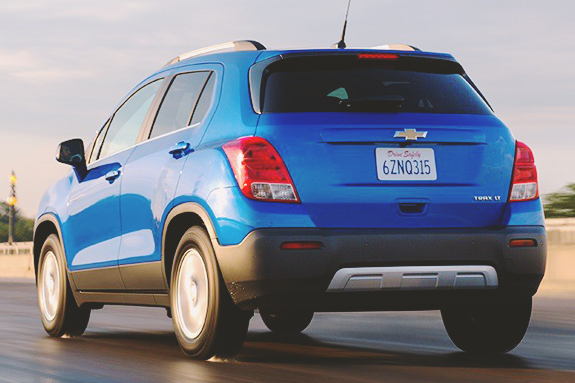 The 2015 Chevy Trax with available AWD tackles any environment it encounters, keeping its driver and passengers safe. For maximum efficiency, the 2015 Trax with AWD automatically shifts into FWD when the AWD is not needed. This technology gives drivers both peace of mind, and extra money in their pocket.. The 2015 Chevy Trax offers more standard safety features than any of its competition. The 2015 Trax has already earned strong crash-test score ratings from the National Highway Traffic Safety Administration, earning an overall rating of five out of five stars. It comes standard with ten airbags, a rear-vision backup camera, electronic stability control, and traction control. Chevrolet packs more advanced standard safety features than any of its competitors, making the Trax a real standout in the subcompact SUV market. OnStar with emergency response services is also available on the 2015 Trax, as well as Chevy’s noteworthy advanced Park Assist technology. Siri Eyes Free is a technology employed in the 2015 Chevy Trax, allowing drivers to make and receive calls and texts from their smartphone device, all without lifting a finger. Chevrolet has made safety a priority in the 2015 Chevy Trax, and that fact is apparent with all of the standard and available safety features that the Trax features.